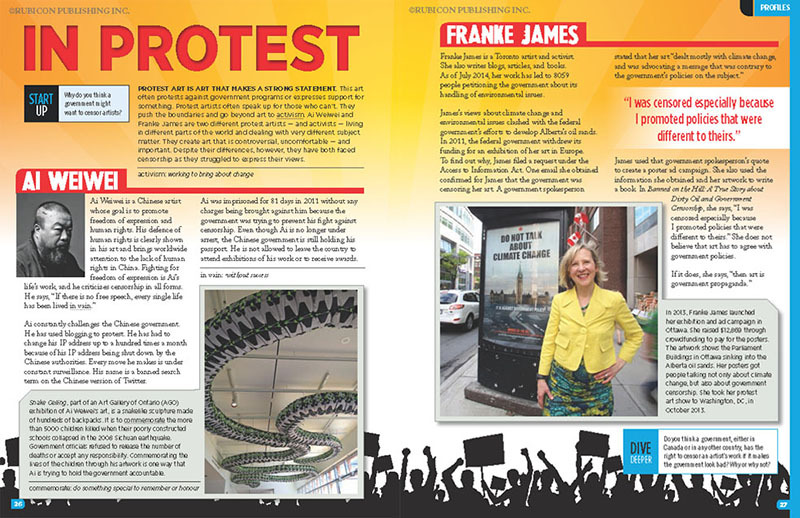 Franke James is a Canadian activist, artist, author, and songwriter focused on the environment, human rights and free expression. 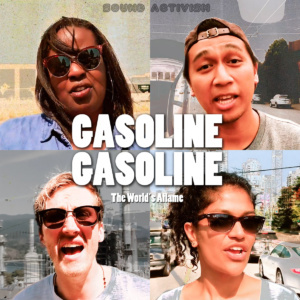 Scored to a funky dance beat by Billiam James, the lyrics describe our frustrations with gasoline through the lens of a romance gone wrong. The production features vocals by four Vancouver hip-hop artists Missy D, Francis Arevalo, Sejal Lal, and Lindal. They are joined in the video by Bill McKibben, founder of 350.org, who sings along, “We gotta leave you in the ground.” The music video also features a cameo by former Michigan governor, Jennifer Granholm. Coltura.org is the Executive producer of the song and video. The non-profit’s goal is to end the gasoline era by spurring adoption of clean vehicles and phasing out sales of new gasoline and diesel vehicles by 2030. James is the recipient of BCCLA’s Liberty Award for Excellence in the Arts. In 2015, BCCLA hosted a solo exhibition of James’ “Dangerous Art“, which included a series of posters based on access to information documents called “Six Easy Ways to Crush Free Expression”. James has a Master of Fine Arts from the University of Victoria, and a Bachelor of Fine Arts from Mount Allison University. She is a Member of The Writer’s Union of Canada, SOCAN, the Songwriters Association of Canada, Arts BC, BCCLA, and PEN Canada. Throughout her artistic career, she has received awards and support from Canadian institutions including Telefilm Canada, the Ontario Media Development Corporation, the Banff Centre, the Gairdner Foundation, Mount Allison University, the University of Victoria and others. Banned on the Hill and Franke James win awards in 2014! 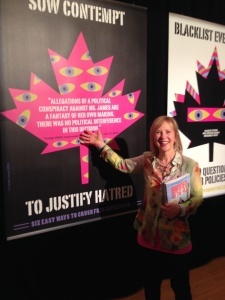 Banned on the Hill won the Gold Award for non-fiction, Canada-East at the Independent Publisher Book awards. Foreword Reviews honoured Banned on the Hill with the IndieFab Silver Award for Ecology and Environment. 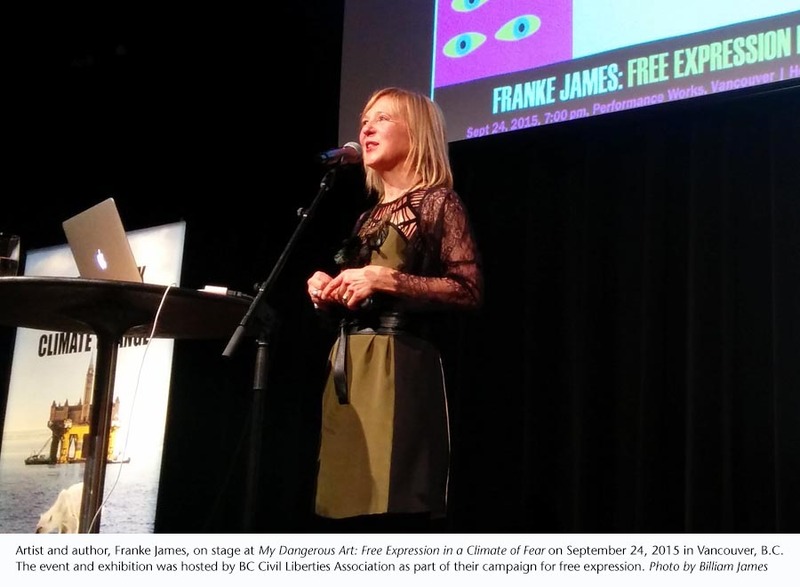 Franke James was awarded the Liberty Award 2014 for Excellence in the Arts, by the BC Civil Liberties Association, at their gala event on June 19, 2014, in Vancouver BC. The pro-oil Canadian federal government is gagging artists and scientists, trampling Canada’s long record as a global leader in environmental protection and human rights, all to promote tar sands, the dirtiest source of oil on Earth. Franke James is one Canadian who isn’t taking it. She has been called, “a wicked thorn in Stephen Harper’s side” and a ‘troublesome artist.’ Why? All for asking tough questions about Canada’s dirty oil, leaky pipelines, and failing environmental record. Her story “What is Harper afraid of?” has motivated nearly 8,000 people to write to Ottawa to register their concerns. “Banned on the Hill. It’s absolutely outstanding. It’s a tour de force and if you haven’t bought a copy, buy one. And then buy a second one for your kids and your grandchildren. Because we’ve got to get the youth. We don’t have an awful lot of youth in the room here tonight. James’ experience fighting government censorship is being used to teach grade school students. Scholastic’s textbook “CENSORSHIP” features James as an example of how artists can effectively fight back against government censorship. James is a contributing author to the book “Access to Information and Social Justice: Critical Research Strategies for Journalists, Scholars, and Activists” by Kevin Walby, University of Winnipeg and Jamie Brownlee from Carleton University. Key lessons she learned from fighting for the release of government information is included in her illustrated chapter, “Games Bureaucats Play” in “Access to Information and Social Justice”. “But there is apparently one woman whom the government can’t shut up: the Toronto environmental writer, illustrator and activist Franke James, who turned the efforts to silence her into material for a new book. “Banned on the Hill: A True Story about Dirty Oil and Government Censorship, released this week, shows how Canadian bureaucrats tried to silence James because her views on climate change clashed with the Harper government’s push to develop Alberta’s tar sands. The artist has vigorously and creatively fought back against the government’s interference and censorship calling it an infringement on her right to free expression. James used freedom of information laws to obtain 2,172 internal government documents concerning herself. She has mounted two crowd-funded art shows to protest the silencing of environmental voices. The first show took place in 2011 in Canada’s capital city, Ottawa. James has organized a new outdoor crowd-funded poster show to coincide with the publication of her new book, Banned on the Hill. It features an ominous art work inspired by the Canadian government and James personal experience of being censored. The work shows the Canadian Parliament Buildings dropped into tar sands with the words, “Do Not Talk about Climate Change. It is against government policy.” The poster show is travelling to Canadian and U.S. cities in 2013. James’ books, visual stories, games and videos are focused on the environment, ethics and social justice. In addition to Banned on the Hill, James is the author of two award-winning books, Bothered By My Green Conscience and Dear Office-Politics. She has a Master of Fine Arts from the University of Victoria, and a Bachelor of Fine Arts from Mount Allison University. 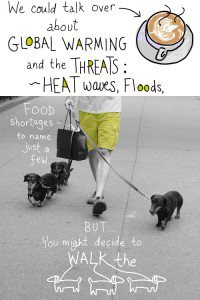 See Franke James’ Indiegogo campaign in May-June 2013. In addition to Banned on the Hill, James is the author of two award-winning books, Bothered By My Green Conscience and Dear Office-Politics. Both were published in 2009. In Bothered by My Green Conscience, she recounts her adventures in going green, which included selling her only car, an SUV, and fighting bureaucracy at City Hall for the right to build a green driveway. (She won!) Franke’s artwork and books have won awards and been featured in print, TV, radio and online in Canada, the USA and in many parts of the world. She has delivered keynotes, speeches and workshops at educational events in Canada and the USA. Franke James merges science, art and storytelling to inspire people to take action and “do the hardest thing first” for the planet. Her most recent interactive quiz “How many climate deniers could you fight off?” combines humour, art, politics and science to provoke players to take action and stand up for the planet. James contributes articles to various magazines including DeSmogBlog, Corporate Knights Magazine, Grist, ThinkProgress, and YES! Magazine. On November 2, 2011, Franke James opened her “Banned on the Hill” artshow to protest the Harper Government’s censorship of her artwork, and the muzzling of environmental scientists. Her poster artshow in Ottawa was strategically located around the corner from the Parliament Buildings. Using outdoor ad media financed with crowdfunding, Franke was able to shine a bright light on the silencing of environmental voices. See Franke’s Blacklisting index for related videos, articles and access to information documents. James made news headlines for her environmental actions by successfully winning permission from Toronto City Hall for the right to build a green driveway. Her work has been featured on the CBC National News, CBC Radio, Grist, Change.org, 350.org, Treehugger, YES! Magazine, Gopher Illustrated Magazine, The Toronto Star, National Post, Montreal Gazette, Times-Colonist, Ottawa Citizen, Worldchanging, and in numerous blogs. Her story A Green Winter was part of an anthology entitled Perspectives on Contemporary Issues that included stories from Stephen Lewis, Margaret Atwood, and David Suzuki. Franke produced A Green Winter as an animated short. It was screened at the 2007 Green Living Show between appearances by Al Gore and Robert Kennedy, Jr. Reviews and Interviews: Bothered by My Green Conscience. The double-page color spread featured six artworks by Franke James, plus a photo. 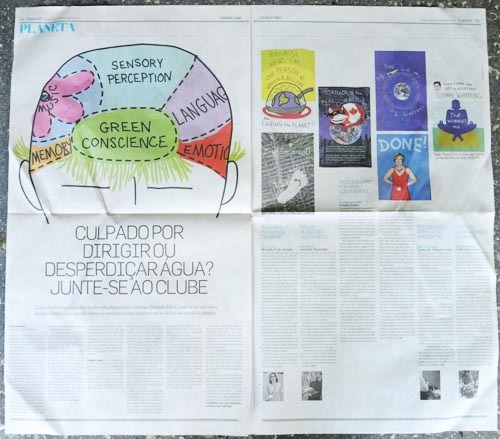 See: Do Brazilians have a Green Conscience? And will it motivate them to take action? with more information and links to Karina’s articles in Portuguese. GopherIllustrated, a Venezuelan magazine that defines itself as “a collectible in motion,” interviewed Franke in June 2010, and featured her visual essay, No One Will Know, Except You. Read the feature article by Michu Benaim. 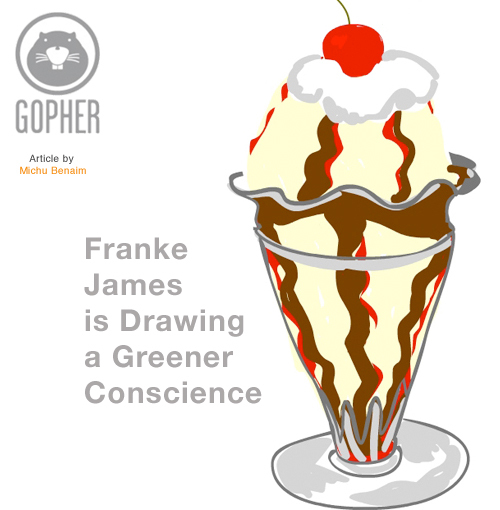 “Franke James likes doing the hard things first, which is why, when it came to reducing her carbon footprint, she skipped right past the programmable thermostat and coffee thermos business and headed straight for the real green challenge — selling her SUV and replacing the driveway with a garden… Read more…” See as newspaper pdf. James is the inventor of an ethical dilemma-based game: Dear Office-Politics, the game everyone plays. The game launched in 2004 and has recently been published as a game & book. The dilemmas are based on letters submitted to the Office-Politics.com web site from 2002 to 2007. It has found a special niche in the training market, and won positive reviews from organizations as diverse as Unicef and the US Army. Feedback from players has been excellent and demonstrates that it can be a useful tool in bringing office politics problems into the open. The game is useful for team building, enhancing communication, exercising ethical muscles, raising awareness, and understanding culture and fit. The James Gang’s satirical humour grabbed headlines during the three Canadian Federal Elections in 2004, 2006, and 2008. The Whack the PM online game drew more than 33,000 visitors to the site. The Toronto Star, National Post, CBC Radio, CTV News, Global TV News, CH TV News, CKOM Saskatoon, 610 CKV, QR77 Calgary Today, London Free Press, the McLuhan Foundation blog plus numerous online sources, also covered the ‘whacky’ story. It is half past 4 in the morning and I cannot sleep because I couldn’t stop thinking and so I decided to look what’s going on in the web AND I FOUND YOU!!!! We are a group of international artists named “Webism Group of Worldwide Artists”. 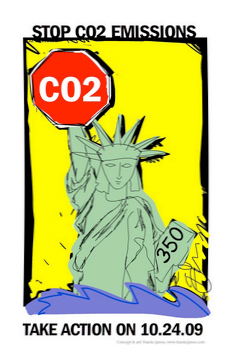 Right now we work on a climate change art show traveling around the globe. And – meant to be – right now the Canada/USA branch of the show is in a Toronto gallery!!! At NING we run our affiliated “Webism Social Network”. Please join us. That would be a pleasure. Will try to go back to bed now to get at least two hours of sleep. i just have to say how inspired i am by your work. it’s so flabbergastingly refreshing and fun and important and gorgeous. i wish i had thought of the dinner idea first – cause now you definitely can’t accept all the dinner invitations you’re going to get! but i think i’m going to spread the word about ‘dinner with a stranger.’ it’s cool beans. Thanks for your wonderful note — glad you enjoyed my essay — but most important glad to hear you are going to spread the word on this fun and inspiring way to raise money for good causes. Thanks for your comment… I look forward to keeping up with your cool work! Thanks for writing about Dinner with a Stranger. I enjoyed your article and your enthusiasm tremendously. Glad to hear that you like this way of communicating too! I love your work. It is vibrant and carries powerful messages! I wonder if you will consider writing a children’s picture book for Memetales? Memetales is a collaboration space for inspired picture books with a revenue sharing model. We work with the best but untapped talent and get them much deserved attention by helping them create inspiring, different and quality picture books for children. I do understand you probably do not need the attention :) but you would be incredibly inspiring for the others collaborating now! Michael McGee introduced me to your work on email. He said I would like it. And indeed! Your work is so inspiring. Thank you for doing what you are doing. It helps make this world a better place one little drawing at a time. My name is Lise and I am from beautiful Nova Scotia! I am looking to get in touch with you to discuss an event which is being organized in Ottawa called: “100000 on the Hill”. Perhaps you have already heard of it. I love your books and your blogs, and I thought of you when we were thinking of who would be interesting people to have at this event. I would love to hear from you. If you could contact me with your contact information I would very much appreciate it. Thanks so much for you, and all you do. Look forward to hearing more about your event. I’m a big fan of your work and wonder if you might be able to help me promote a campaign to help protect our oceans, in support of The David Suzuki Foundation? Genuine Health (the company that makes greens+) has partnered with DSF to ask people to post online something that makes them happy. For every post received, the company will make a donation to the DSF to conserve our oceans and fisheries. Perhaps something you can tweet about? i am an artist and Art Educationist based in Africa (Nigeria) on 10/10/10 we broke the Guinness World Records for the Largest painting by Number, we had 350 volutees painting for 350 hours, and the painting ended 10/10/10 time:10pm10min10sec. i have been looking at browsing through your webpage and i found your work of Art so amazing. Please we will need your technical support for our next campaign in Nigeria for children (350,000 children) making paintings on how to reduce C02 to 350. Franke, I didn’t know about your work until I heard about your recent fiasco with our government. Your art fills me with hope. Your commitment to the environment (without which we have nothing) is awesome. Your courage is essential if WE are to go forward. I am hopeful that young artists like you will be a powerful force in opening the eyes and hearts of fearful, disillusioned, disconnected people everywhere. This article is great, it reminds me of Woodstock ’99 where artist paint walls about world peace and environment. Franke, your work is so inspiring. It’s perfect to use art and storytelling to inspire people to “do the hardest thing first” for our planet. Real fresh point of view, looking at art work to get the message across. Masi cho! Look: the point to Franke is that she does not bloviate, she DOES. Franke does not simply posture, she ASKS. She maintains an open curiousity and is not afraid to make herself the A-Number One experimental subject of all lines of honest-hearted inquiry. Franke, dear, you are in good company even as this blacklisting has to be infuriating. hi, I am wanting to build a green driveway and I am having some trouble locating a place to buy the Permaturf….Is there a dealer in Toronto or do I have to get it shipped to me from the USA? A Canadian friend here in Cologne (Germany) put on to you and I have been checking out your work. Bravo! I also have an environmental art-project called “Postcard Politics” (www.postcardpolitics.org) so maybe you would like to take a look? And, if you send me your postal address, I could send you a selection of my postcards. Wishing you all the best with your work and I’ll see if I can get hold of a copy of your book.